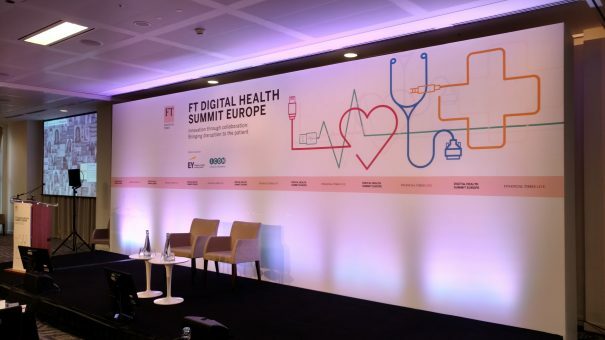 The Financial Times Digital Health Summit Europe brought together key opinion leaders and innovators in the digital health field to discuss the biggest challenges facing healthcare in London yesterday. Marco Ricci reviews some of the highlights of the conference. The promise of digital technology to transform healthcare is now widely accepted by policymakers in Europe and the US, but making the transition to digitally-enabled health services is proving to be a huge undertaking – not only in terms of technical requirements, but also as a cultural shift. Meanwhile, the pharmaceutical industry is also on a learning curve, finding out through trial and error about which digital services and tools work, and which don’t. The next behaviour highlighted by the panel for being in need of disruption was a competitive mindset between pharma companies which was proving counterproductive. Yeoman commented on the isolated work pharma companies and healthcare stakeholders currently undertake, referring to the range of companion apps developed by pharma companies which, although effective on their own, becomes too much hassle for the patient if they are taking numerous drugs all with their own accompanying apps. The panel’s talk, despite the inspirational anecdotes told by Dr Agrawal in regards to the MSD for Mothers global project and the equal rights for disabled people project Change People described by Duman, was a harsh reminder that there is still plenty to be changed before digital can truly flourish in the healthcare environment. Who will drive the digital revolution? 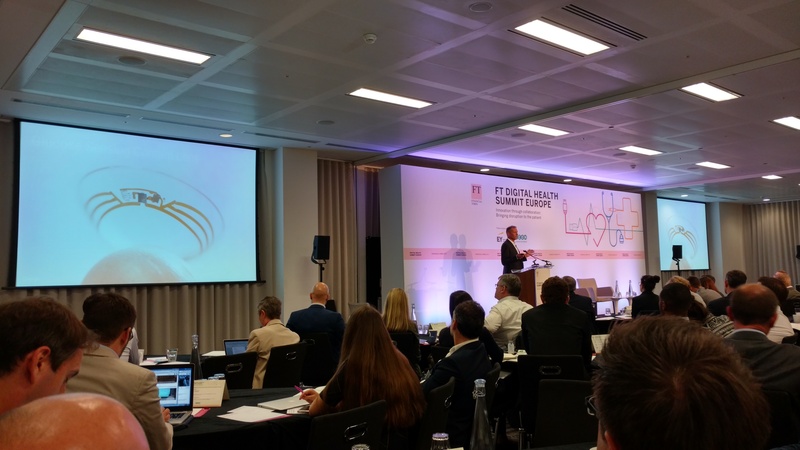 Dr Karl Pall, director of Brand Solutions, Division of Adult and Community Health at Google, gave a keynote address, probing whether the big digital firms really viewed healthcare as a consumer-led market. The answer? Yes they do – and that shouldn’t come as a surprise considering Google’s own drive to enter the market. Pall initially described the change in behaviour that has occurred in the world’s population with the growing availability of technological solutions, highlighting the exponential drop in time to adopt brand new technologies ranging from radio through to YouTube. Alongside the world’s growing ability to adopt these technologies is a current passive interest in digital health solutions, which Pall highlighted when referring to the statistic that 1 in 20 Google searches are health related. He then insisted that what is needed is a means of using that data to drive an overall adoption of digital health. Pall’s talk highlighted the fact that the healthcare sector is a very different environment to what it was a decade or so ago and is primed for a digital revolution. His comparison with the general ability to adopt technology made it clear that the same situation would likely unfold in the healthcare setting – all that is required is a joint effort to deliver it. 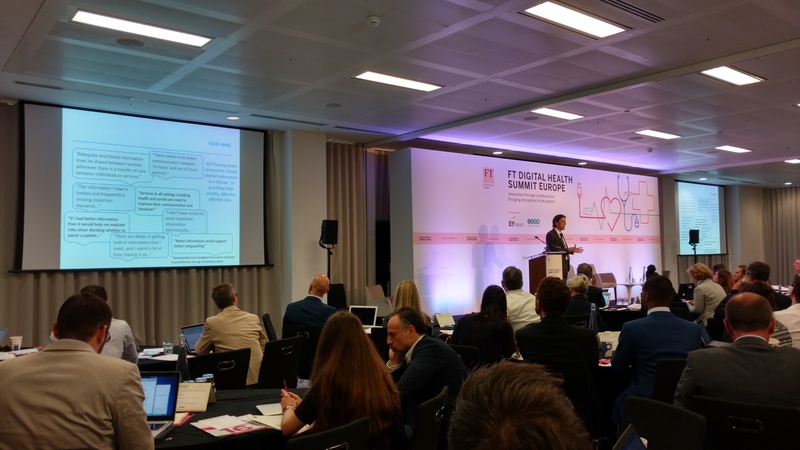 It would be easy to be swept away in a feeling of dismay with all of the obstacles still in the way of a complete digital health revolution, however there were a few examples offered to demonstrate how positive an effect a digital approach can have in delivering healthcare. The second keynote speech of the day came from Andy Kinnear, Director of Digital Transformation for the NHS South, Central and West Commissioning Support Unit. He provided an overview of the Bristol interoperability programme Connecting Care which was developed in order to create a consistent, electronic summary record of every patient’s care in the area. Initially listing the fragmented nature of the NHS service in Bristol, Kinnear described the need for bridging the gaps between the siloed information held in each of the many Bristol public health bodies as well as throughout the NHS as a whole. Between 2012 and 2015, the Connecting Care solution was rolled out across Bristol in an attempt to address this major issue. Kinnear described its success in drastically lowering costs and time windows across all aspects of a patient’s health journey. The next positive examples for digital health came in the form of four start-up companies that were the subjects of the afternoon’s Start-up Spotlight session. On display was a range of different initiatives: Babylon, dubbed as ‘everyone’s personal health service’, boasted the ability to connect patients directly to clinicians and experts in their condition as well as allowing patients to access their clinical records. Junomedical demonstrated its medical search engine-like capabilities, helping patients find the most relevant international hospitals and clinicians for their desired medical attention. Big Health aims to help one million people back to good mental health by 2020. 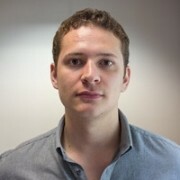 The company uses a platform for helping people with mental health issues by providing a sleep quality service and cognitive behaviour therapy (CBT) personalised to each individual. Finally, HealthUnlocked demonstrated the ability to create dialogue and help those with health issues through the creation of a health-specific social networking platform. Amidst conversation that often led to a feeling of incorporating digital into health being a truly daunting task, both Kinnear’s case study and the start-up spotlight participants gave an uplifting reminder, not only that it is in fact possible, but also that when it’s done right, it can be incredibly effective.